Crazy busy week with British cars in the corral and no real rhyme or reason to why there was such a huge crowd other than it being a holiday weekend. 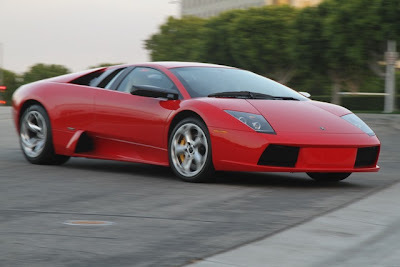 For those who think the current crop of high-end auto tuners like Mansory, Novitec, Hamann and the rest are pushing the boundaries of sanity (not to mention good taste) by modifying exotic cars that already offer outrageous performance, you should know that there was a time when these cars would have looked tame in comparison. 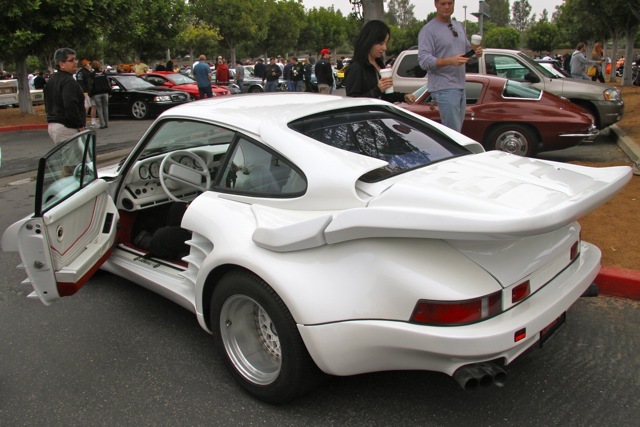 Back in the 1980s, companies like b+b, Strosek, Koenig and Gemballa were creating fantastical rides like the one you see here. Even before the Testarossa and 348, Ferrari's cheese grater side strakes were popping up on the sides of Porsches that had been converted to slant nose, projector light, retractable hood spoiler, BBS mag'd, aero mirrored, scooped and spoilered dream machines. 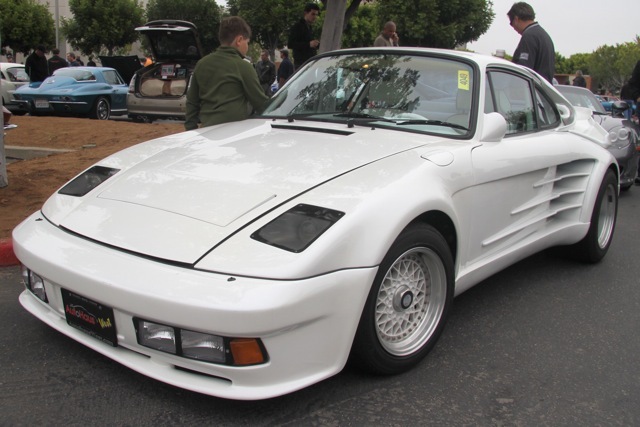 The fact that this one happens to be white with a white interior, with white BBS wheels and one of the most fanciful air scoop/whale tale combos ever crafted, makes it the poster child for this era. The fact that this didn't immediately put Gemballa out of business speaks volumes to the popularity of these conversions, but the fact that his is the only name that has stood the test of time also shows that he was smart to start focusing more on horsepower and less on hallucinogenics. Alfa Romeo was the featured marque, by the way, and Lincoln was there too with a really elaborate auto show setup and a full range of new models ready to test drive. 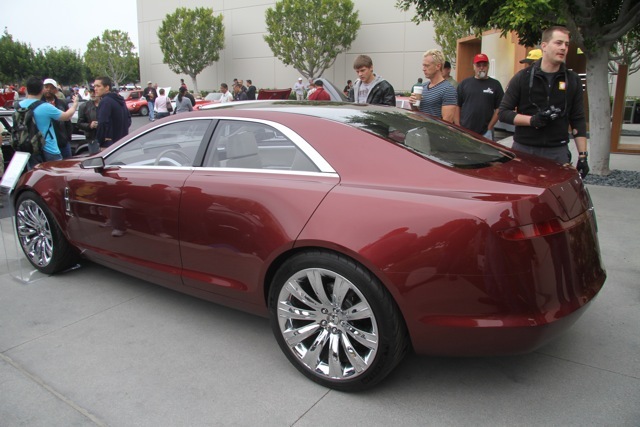 They also brought the stunning MKR concept that would go a long way towards reestablishing Lincoln's reputation as a major sport/luxury player. The long list of unique pairings at the show today included our first Aston Martin Virage with a rat/hot rod show winner, a beautiful A-M DB6 with a Ferrari 599 GTB, a black and yellow Porsche GT2 with a 356, late-model turbo V8 Lotus Esprit and an early non-turbo predecessor, new hatchback Audi A7 and an R8, Maserati Merak and DeTomaso Pantera, white awd Gallardo and white awd GMC Typhoon, Citroen DS and BMW 3.0 CSi, Lotus Evora and Maserati GranTurismo, Renault 2CV and Chevy Malibu, jack-o-lantern fox-bodied Mustang and a GT3 RS, a Jag XJ6 and an LT1 small block...and so on. 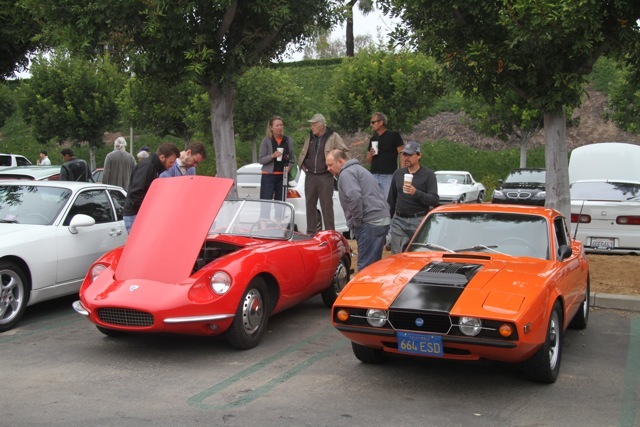 Late-model Challengers were plentiful and so were random rare exotics. Any one of these could have been the star of the show, so it is amazing that today we also got to see a Ferrari 275 GTS/4, Lamborghini LM/A, Saab Quantum III (! ), Mercedes F-Cell, Lotus Esprit Sport 350 and a Cobra FIA, all in the same place at the same time. The total number of all of these combined can probably be counted on your fingers and toes. 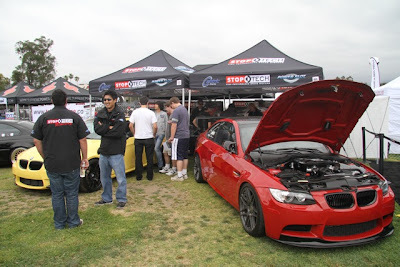 I attended my first Bimmerfest last weekend up at the Rose Bowl. There is something to be said for seeing 3,000 BMWs all in one place at the same time, I'll tell you. I covered the show for my new company already and will simply link to those posts here for simplicity sake. Make sure you bookmark our blogs (here too) and follow us on Facebook and Twitter too. Centric Parts is one of the largest replacement brake suppliers, and its Power Slot and StopTech performance divisions have brake upgrade kits for stock caliper or rotor sizes to upsized balanced brake kits to full on race systems. If you are looking for brakes, we should be your first stop. I almost skipped this weekend's show again, as I had to get up to the Rose Bowl to help my company at Bimmerfest 2011 and didn't know that I wanted to cover the extra miles and get up any earlier than I needed to. Whenever I feel that urge to stay in bed I know I have to get up because I'm bound to miss something special. This weekend was another prime example. The first thing I saw in the lot was a yellow Carrera GT that for some reason nobody else seemed to notice. 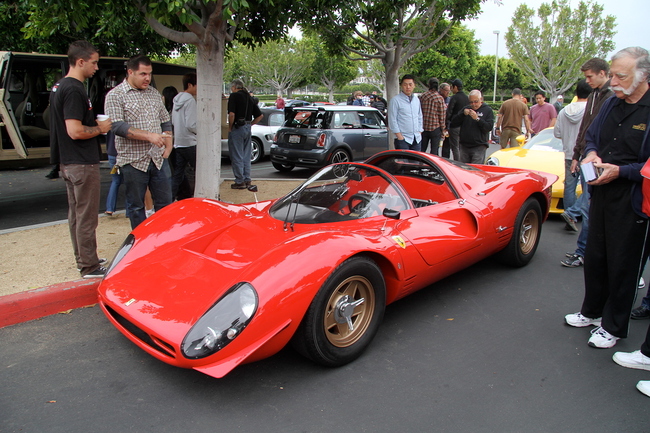 As I got closer I realized why – there was a Ferrari 330 P4 parked in front of it. Now, I don't think I need to remind any of you, but the P4 is one of the most valuable and beautiful Ferraris of all time. It also happens to be my favorite car, period. I knew this had to be a replica, but even a replica is rare enough to draw a massive crowd, and this one happened to be a really good one. It was one of the first cars put together by Jim Carpenter back in 1990. It is based on a 1979 Ferrari 308 GT4 and took about 3000 man hours to build. Although I wasn't lined up to get the shot, one of the Superformance Ford GT40s rolled past, recreating one of the most famous Ferrari vs Ford matchups ever. I don't know whether or not those in attendance knew this was a replica, but that didn't take much away from seeing it parked right in our own show lot on this gloomy Saturday morning. With D-Types, GT40s, Daytona Coupes, GTOs, 906 Porsches and now this 330, Cars & Coffee could run its own class in Monterey for the Historics. Throw in all of the modern race cars that have shown over the years and we could probably do a Le Mans 24 hour class as well. 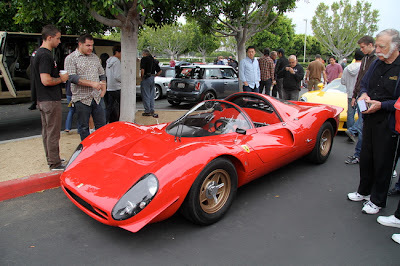 Next to the Ferrari was a Millenworks LUV, almost the exact opposite of the 330 P4. Big and brutish, this 8,000-lb beast looked like it ate cars like that for breakfast. Tucked away in the back corner of the lot was a gorgeous blue Lamborghini Countach 5000S. Joe Sackey brought it out and we thanked him profusely. What an incredible car in an absolutely amazing color. A new Murci SV and a Gallardo Superleggera were other noteworthy Lambos. A new Lexus CT200h was there, but I think most people assumed it was a Mazda that had been left in the lot over the weekend. One of the rarest pairings of cars your likely to ever see were both done up in green – an Isuzu VehiCROSS and a Panoz Esperante. My buddy Patrick was at the show, showing off his latest creation – the Olloclip. Its the most intuitive add-on lens set for the iPhone 4. I'm sure he'll do extremely well with it. I had a chance to check it out and it literally takes two seconds to get it working. And the range you get with two simple lenses is amazing. One of the things people might have wanted to shoot with their Olloclip was a bright green Ford Focus RS that shouldn't be in the States. Well, technically, it is here officially, but Ford doesn't sell them here. When you realized the driver was rally star Ken Block, who drives Fords for his day job, it made a little more sense. Ken himself was there, shaking hands, posing for pics and even signing people's cars, shirts, hats and just about anything else they thrust in front of him. Nice guy. I'll have a lot more to say about Block in my new StopTech blog next week. Speaking of which, anybody who follows me on Twitter, Facebook, YouTube, fotki or wherever...should be following StopTech (and Power Slot and Centric Parts) on Twitter and Facebook as well as reading their blogs – StopTech and The Brake Room. A lot of it might seem familiar, but there will be a lot more about brakes and racing and high performance cars. Check it out. A Matra Sports (nee Bonnet) Djet showed up today, adding another page to the book of "wildly obscure marques that have shown at Cars & Coffee" or its progenitor, Crystal Cove. Last week's TVR ticked another box on the "models from Europe we'd give our left wingnuts for" checklist, and now the marques page is one funky Frog richer. The Matra Djet was a French sports car designed by René Bonnet (the "B" in "DB," another obscure make that is regularly represented at this show) and modified by Matra. The car had various names in its life from 1962 till 1968: René Bonnet Djet, Matra Bonnet Djet, Matra Sports Djet and finally Matra Sports Jet. The car started out as the René Bonnet Djet in June 1962. It was named Djet, because Bonnet thought the French could not pronounce the word "jet" correctly. It was powered by a 1108 cc inline-four from the Renault 8, mounted amidships and mated to a Renault Estafette gearbox, giving it a top speed of 103 mph. With an uprated Gordini engine, the "Djet II" was good for 118 mph. The fiberglass body was made by Matra, which was glued to a steel chassis. It had a very modern design with disc brakes and independent suspension with wishbones and coil springs all around. The 1,300-lb. Bonnet Djet was the worlds first mid engined production road car when it was introduced in 1962, beating the de Tomaso Vallelunga (1963) by nearly a year and the Lamborghini Miura (1966) by four. There were 198 Bonnet Djets produced during the two years before Matra took over Bonnet in 1964. When Bonnet had gotten into financial troubles, Matra (who supplied both the bodyshells and the factory location) took over René Bonnet Automobiles and ended production of the original Djet in December 1964. Matra's CEO, Jean-Luc Lagardère, saw it as an opportunity to expand Matra's business to the automobile market. Matra hired former Simca designer Philippe Guédon and modified the original Bonnet Djet. The car became slightly bigger and now weighed 1,455 lb. Production resumed in April 1965 with two new versions, called the Matra Bonnet Djet V and Djet V S (with the Gordini spec engine). After the Salon de l'Auto Paris auto show in 1965, the Roman numerals and the Bonnet name were finally dropped. 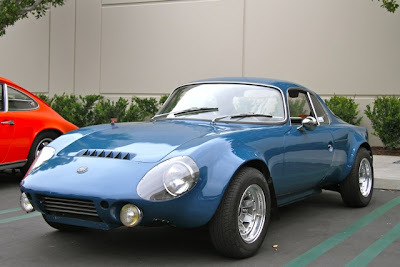 The car was now called the Matra Sports Djet 5. In 1966, a version with a bigger Gordini engine became available and the Djet name was dropped in favor of its original meaning: Jet. The model range now consisted of the Jet 5 (1108 cc Renault 8 Major engine), Jet 5 S (1108 cc Renault 8 Gordini engine) and Jet 6 (1255 cc Renault Gordini engine). Altogether, another 1491 Matra Djets were produced before production ended in 1968. And one of them was in Irvine today, along with...well, check out the pics and see for yourself.